With four regions across the state of Texas, Bass Champs Tournament Trail continues to give the weekend warriors consistent chances to win money like the pros. Twenty three teams enjoyed winnings of over $48,000, with McWhirter & McClendon taking the lions share winning 1st place and the guaranteed $20,000 check. There is no question of summer being here and well established with extremely hot days. The heat was knocked off just a little bit with a constant wind but that only added to the challenges these 174 teams had to face with 25+ mph constant winds and the waves it produced. Both anglers and their equipment got their workout just trying to hold on to fishing holes, and to add to it the bite was very light. Anglers were allowed to trailer their boats closer to their spots to minimize travel on the water. Mark McWhirter, owner of a telecommunications company, fishes Bass Champs regularly, but his partner was not available for this tournament. He asked Barrett McClendon, full time student and bank/marketing firm intern to fill in. "Once we were informed that it was going to be a trailering event, we decided to get out there and secure our first spot early," explained Barrett McClendon. "We had a bunch of deep fish located there, and got to the boat ramp at 2am. When we arrived at our spot at 4:32am, someone was already there." Somewhat dismayed, but not daunted, he and partner Mark McWhirter went to their Plan B area. 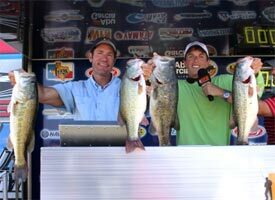 "Our second spot had a bunch of four pounders in it at practice. Once we started fishing, we caught two of them, then left." They headed to a brush pile sitting in 30 deep water and caught their kicker weighing 7.71 lbs. "Being caught so deep, it didnt take long before the fish was getting stressed, so we took it in to be weighed. After that, we went back to our Plan B spot, and Mark caught two seven pounders, I boated another four pounder. It was a pond dam 10 deep that dropped to 18. We used Carolina rigged Lake Fork Tackle 10 worms and ring frys as well as jigs for our fish. We caught the biggest one on a Texas rigged 10 worm." Leslie Kennedy & Trevor Romans took 2nd place with 22.69 lbs. "We stayed on main lake flats, fishing the windy side of them." They flipped trees in depths of 2 to 15 deep using 10 Power Worms and big brush hogs. "We wore our trolling motor out, and only caught six keepers all day. Two of them were pretty nice, 7 and 6 pounders. They were just the right combination to win 2nd place, only by 4/100ths of a pound." Bass Champs presented them with a $3,000 check for their 2nd place win, then Skeeter Boats doubled their money for fishing from a qualified Skeeter rig. They also won the Fun N Sun bonus for another $500 giving them a $6,500 total payday. Wed like to thank Fun N Sun, Black Angel Jigs, Bumper Stumper Lures and Anglers Pro Tackle for supporting us. 3rd place was won by John Mayben & Eric Thompson with 22.65 lbs. Their day started out rough. First thing, right at the boat ramp, they lost their keys in the water. Once they got moving, they found that their graphics werent working. Heading out to their first spot, someone was already sitting on it. They were determined to overcome their obstacles. "The bite wasnt too good for us in the morning, but we finally found some around 11:00." They sat on a deep rocky point with timber on it ranging from 15-25 deep. The wind was blowing around 20-25 mph, and the anchor couldn't hold us. Using Carolina rigged 10 Lake Fork worms, they caught four pretty quick in that spot. The last hour, they caught two more, and they proved to be just the right ones. Their kicker for the day weighed 8.50 lbs, anchoring their 3rd place win. "I straightened the hook out on one that probably would have helped." They received $2,000 for their 3rd place win. Their sponsors include St. Croix, Stanley Jigs and Met Auto Sales. Tommy Climer Jr caught the biggest bass of the day, fishing with his brother Tony. At around 10:30 they only had one five pounder in the box. Using a Zoom craw worm, Tommy pitched to a cedar tree about 4 deep. It was a very subtle bite as the bass just picked it up and slowly moved off. Then it got wrapped up in the tree for a few seconds. Once free, the lunker headed for deep water. Tony knew it was a big one at that point, but had no idea just how big. Seeing his brother trying to wrangle the big bass, Tony asked, "Is it big?" To which Tommy replied, "It's big, get the net." The bass weighed 9.35 lbs, good enough to win the $1,000 Big Bass check, and secured their overall 7th place win for another $1,040. Costa Del Mar and WFN added to their winnings with their sponsor incentive bonuses as well.This was originally scheduled to be the final tournament for the North Region, but the kick-off event was cancelled due to harsh winter weather. The North Region will wrap up on Cedar Creek July 23, 2011 and as always is open to anyone who would like to fish. Whichever team achieves the highest points ranking after five events will be donned anglers of the year and their 2012 entries into the North Region tournaments will be waived. Any team who has fished all five events in any region qualifies to fish all four championships. The winner at each one will receive a brand new Skeeter ZX 225 powered by a Yamaha 225 SHO, equipped with MinnKota & Humminbird valued at $55,000.